Someone has thoughtfully created a range name called Children. 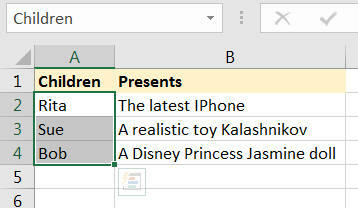 The idea is that your Excel macro will substitute in each child's present request at the first bookmark, and their name at the second one. Goes to the Present bookmark and writes in the child's present request. Goes to the ChildName bookmark and writes in the child's name. Saves this document, using the child's name as a file name. doc.Bookmarks("Present").Range.Text = "A really fluffy owl"
Test that your macro contains one letter for each child, then save it as Suffer the little children.xlsm and close it down, reflecting on another tedious Christmas task now automated!